I'm not quite sure how I allow myself to get into these situations, but here's another case of Real Life doing an end run around my plans to stick to my UFO pile. Earlier this year, my oldest DD, who is living in an apartment while she attends college, had bemoaned the fact that she had absolutely no space for a Christmas Tree and she was Very Sad. 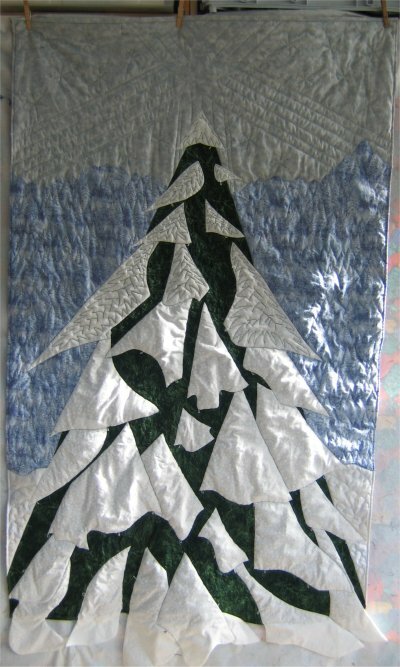 Being the supportive Mom that I am, I suggested that I could make her a quilted Christmas Tree wall-hanging as a substitute. 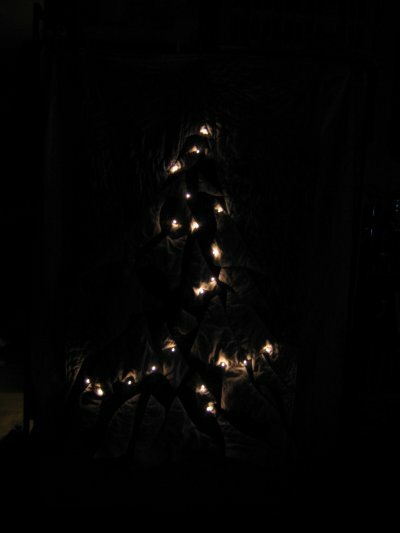 From that, it evolved into a wall-hanging that she could actually hang real ornaments on and that real lights could be used. At that point, we just left the discussion where it was. Over Thanksgiving, she was able to come home and the project was resurrected. She drew a full-sized pattern for me to work from; we raided my stash (pitifully lacking in appropriate fabrics); augmented fabrics from 2 different LQS. 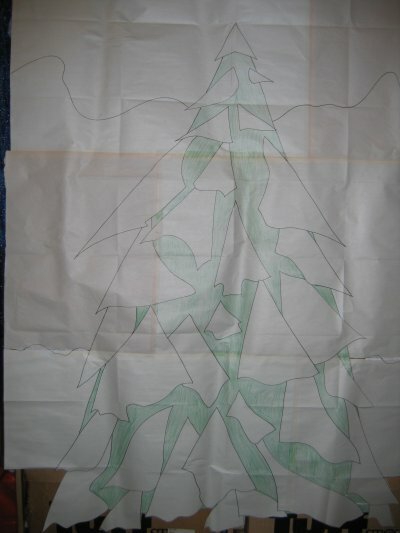 I began working on it and steadily over the days, it began to take shape. DD returned to school and I continued working on her wall-hanging. I put an extra layer of batting in the snow boughs so they would be extra poofy. 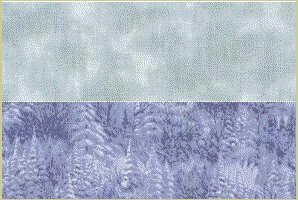 Originally, my daughter wanted "branch shaped" quilting lines on the snow boughs, but after I showed her a picture of it, she decided that she liked the unquilted snow boughs better and could I please remove the quilting? Originally, the thought was to put ribbon loops on the tree so that real ornaments could be hung, but in practice, the ribbon loops looked awful. I substituted loops made from perle cotton. I found some extra tiny mini-tree lights, powered by a battery pack at JoAnn's. I made buttonholes in the wall-hanging where the lights could be pushed through to the front. At night, with the mini-lights turned on, it looks very dramatic. The battery pack was placed in a pocket I sewed to the back of the quilt. Two hanging sleeves where made .. one obviously on the top, but another one on the bottom, so that another rod could be put there for weight ... to help hold the wall-hanging straight.